We are pleased to offer an imposing new build 7 bedroom family home due for completion in September 2012 with charming features situated in an enviable location within the exclusive Coombe Estate. The property comprises of approx 7,500 sq ft of accommodation within approx 0.54 of an acre and also benefits from planning permission for an indoor swimming pool. Coombe Hill Road is within easy access to the Royal Richmond Park via the Kingston Gate which is an area of outstanding beauty, providing a picturesque setting in which to picnic, go horse riding, jogging or just take a leisurely walk. Theatres at Richmond and Wimbledon are also popular alternatives to the West End together with an excellent choice of restaurants. There are also numerous schools for all ages, public, state and international. New Malden, Kingston and Wimbledon town centres with their excellent shopping facilities are all within easy reach as is the A3 trunk road offering fast access to central London and both Gatwick and Heathrow airports via the M25 motorway network. The train station at New Malden provides frequent services to Waterloo with its underground links to points throughout the City; the nearest tube station is Wimbledon. The immediate area offers a wide range of recreational facilities including three golf courses, indoor and outdoor tennis, squash clubs, ten pin bowling, and many swimming pools. Many developers build houses, however, Lifestyle Projects, a renowned local developer, builds superior homes to enjoy. “Coombe Gables”, built to exceptional standards, offers spacious accommodation arranged over three floors, with the advantage of a separate annexe with two rooms and a shower room. “Coombe Gables” has a gracious formal entrance hall which leads to two formal reception rooms with imposing wide and tall bay windows and fireplaces and a formal guest cloakroom. Tall double doors lead into the hub of the house where a spacious family room equipped with base cupboards, ample shelving and a recessed plasma TV, opens into the dining/kitchen area and further on to a study area with a fireplace. Lifestyle Projects can also boast about its own in-house joinery workshop, resulting in exceptional standards of finishing throughout the property. 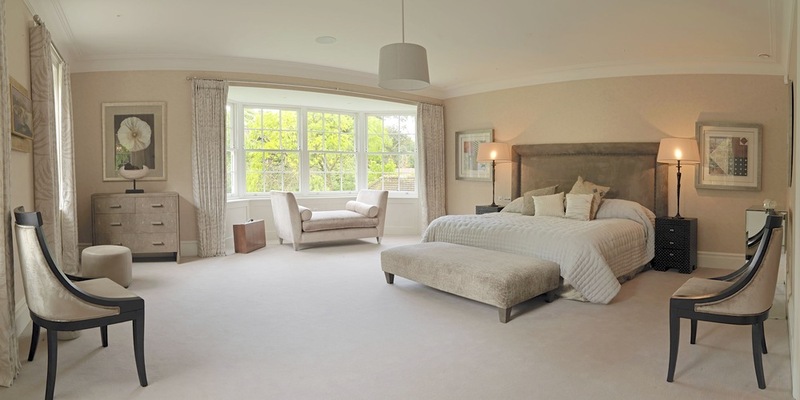 The first floor master bedroom suite boasts a very spacious double aspect bedroom which benefits from both the afternoon and evening sun, and leads to an inner hall with bespoke cabinets and full en suite bathroom. This then continues to a walk-in dressing room and a further room which could be used as a private living room/study to the master, but has an additional door leading back to the landing. Furthermore, on this level there are two more bedrooms, a full family bathroom and utility room, with easy rising staircase leading to the second floor which in turn offers three very spacious rooms and a shower room. The property benefits from quality Mumford & Wood windows and French doors, all of which are double glazed, in addition to under floor heating, cavity insulation, air source heating, solar panels, water harvesting and heat recovery system. The professionally landscaped gardens are fully irrigated to the lawn and borders including the organic vegetable garden. A beautifully laid level lawn leads from the paved terrace to the rear of the property where there is a recessed ornamental pond and fountain. In addition to the double integral garage, there is an outdoor bicycle shed to the side of the house. The forecourt offers parking for at least 8 cars, and is approached via two solid wooden remote control operated gates. Planning permission has also been granted for one indoor swimming pool complex to include changing and shower facilities to be sited on the front lawn. There are many details to be admired within “Coombe Gables” and the only way to fully appreciate the charm and character of the house is to view it internally - Coombe Residential welcomes the opportunity to show the property. This is a home to be loved and enjoyed which is rare amongst new builds. No warranty is given concerning this property, its fittings, equipment or appliances as they have not been tested by the Vendors’ Joint Sole Agents. Measurements are approximate and no responsibility is taken for any error, or mis-statement in these particulars which do not constitute an offer or contract. No representation or warranty whatever is made or given either during negotiations, in particular or elsewhere. No part of this publication may be reproduced in any form without prior written permission of Coombe Residential Ltd. All rights reserved.